The Branson RecPlex is a state-of-the-art sports complex that combines recreation, fitness and sports at one convenient location. 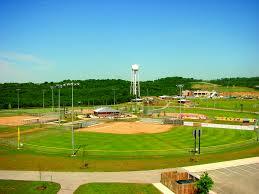 Due to Branson's reputation as a family vacation destination, the facility has become quite popular for tournaments, hosting over 40 state, regional and national tournaments annually. 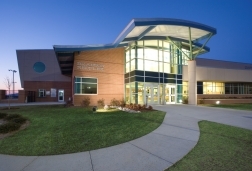 The 44,000 square foot recreation center features two gymnasiums for basketball and volleyball, a fitness center, a 3-lane indoor track, locker rooms, community rooms and concession area. The Facilities are impressive. A very large workout facility upstairs to go along with the track. It is a great place for an afternoon of basketball, as there are normally quite a few people using the gym. It is not uncommon for full 5v5 scrimmages taking place daily. Only 2$ to use the courts and track. See you there! If basketball isn't your sport, perhaps you prefer baseball or soccer. Outdoor sporting facilities include soccer fields, baseball/softball complex, picnic pavilions, a large children's playground and walking paths over the more than 40 acres. The Branson RecPlex even hosts it's own basketball and soccer leagues annually. These leagues offer a great chance for exercise and meeting new people. Stay cool this summer in the 12,250-sq.-ft. AquaPlex that sits adjacent to the RecPlex. This small but beautiful aquatic center features 6 lanes for lap swimming and competition and large water slides. Everything you need to beat the heat this summer!